Heavy duty hard leather case for the Johnson VP600 portable. 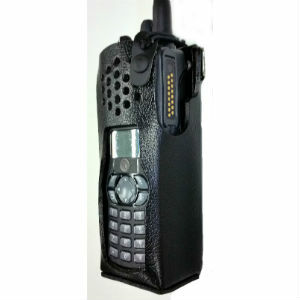 This model has a full leather back with no exposed stitching on the back or bottom that will wear out with heavy use. Designed for the fire fighter to use with a shoulder strap or select on of several belt attachments. Available as a belt loop case or with one of several swivel options. Dee rings for a shoulder strap are standard.